(Sept. 26, 2017) -- Students at The University of Texas at San Antonio (UTSA) have a new tool to help them keep track of deadlines and find resources on campus. 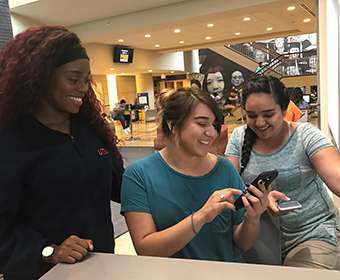 The university recently launched UTSA Guide, a mobile app developed by education research and technology company EAB. UTSA Guide organizes important information such as checklists, or “journeys,” so that students can see at a glance the steps they need to take to stay on track for academic success. Guide sends push notifications to students’ smart phone so that they can stay on top of important deadlines — when to register for classes, when tuition payments are due, and more. Rather than having to remember when to do something, Guide gently reminds students without them having to do anything other than download the app and sign in. The app also includes details of important campus events, resources and contact information related to academic support, student activities, financial services and other areas as well as an accessible screen to view student holds and class schedules. Additionally, the app features a major exploration tool for students who want to explore different programs and career options. How does UTSA Guide differ from the UTSA mobile app? Think of it as a mobile advisor. It compiles the most relevant information for timely degree completion. UTSA students can access Guide by searching for “guide – college simplified” in the App Store or Google Play. Once they download the app, they can select “University of Texas at San Antonio” from the list of participating universities, then log in with their myUTSAID (abc123) credentials. UTSA Guide was piloted during Fall Orientation sessions this summer. Over the summer, more than 3,900 incoming students downloaded the app.